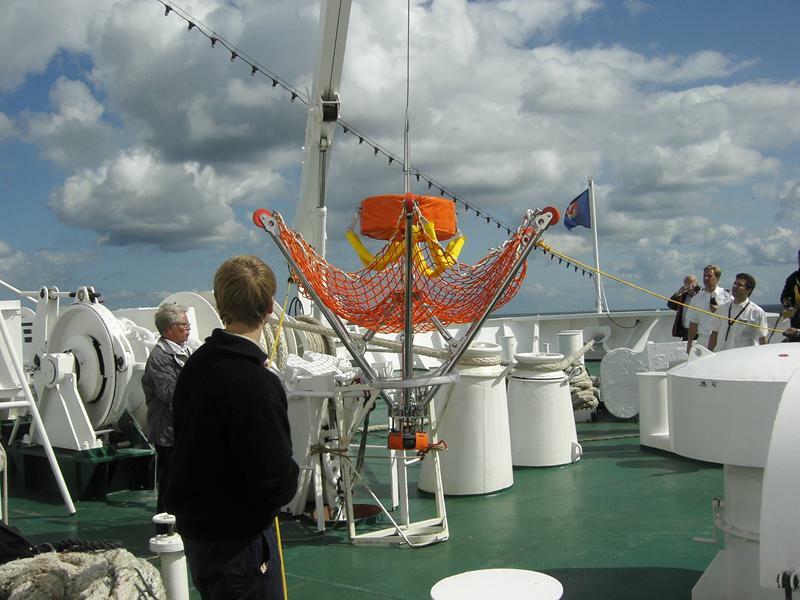 The SARRRAH®-Project is working with developers, experts and potential users for the further development and practical testing of persons rescue systems for commercial and pleasure craft. Until today, it was practice to rescue shipwrecked people out of the water mostly in vertical positions. This has been critisized by experts for considerable time. 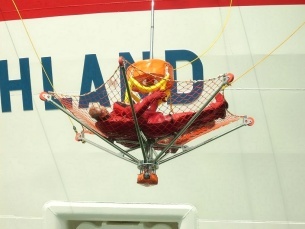 The University of Applied Sciences and Arts, HAWK Hildesheim, Germany has solved the problem technically and medically within the Rescue Lifting System (RLS) research project. In principle, medical doctors demand a protective rescue of weakened persons suffering from hypothermia to avoid rescue death. The victim is only to be moved as little as possible. Until today, this has been an unsolvable task for practitioners. A working group under the auspices of the Ship Safety Division (BG Transport) have been developing profiles for formulations, which may have validity for resce systems on commercial and passenger ships in future. The results - available as demonstration video in our media library - were concerned in February, 2008 in Bonn, Germany in detail by the IMO workgroup "Design and Equipment". Special prints about the Development Project RLS are available from the coordinator on request. With the research report and the research findings, the Forschungs- und Konstruktionsbüro Prof. Michael Schwindt, RLS - Rettungstechnologie GbR, Hildesheim, working in close cooperation with institutions (research establishments, universities/higher education institutions), was able to make a contribution towards solving the problems associated with recovering persons from the water in rough seas from merchant ships in a manner that minimizes the risk of shock. This research report with all the pictures and results you can read here. Our research project has developed special double loops. They are made to achieve a "deckchair" seated position. This position has turned out to be ideal with regard to the rescue manoeuvre, as well as medical demands. 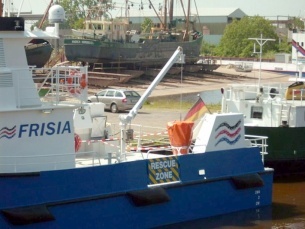 The Ship Safety Division of Berufsgenossenschaft für Transport und Verkehrswirtschaft [BG Transport] (formerly the Ship Safety Department of Seeberufsgenossenschaft), has tested and accepted the RLS for ships. 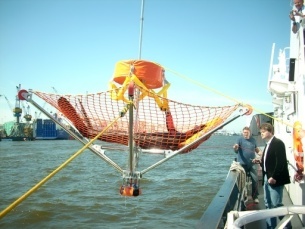 The RLS - Rescue Loops were adjusted in noumerous single studies to the different conditions of vehicles in water and air. RLS - Rescue Loops type G: for manual operation. The RLS type G were equipped with handles for small and open boats that do not have an own hauling device. (operation field for example: rescue boats, dinghys, motor boats, safety boats, jolly-boats, pilot boats, fishing boats ...). 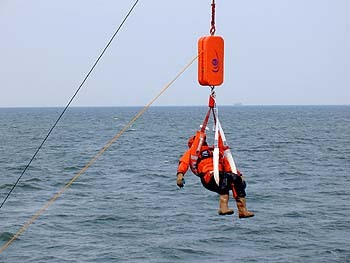 RLS - Rescue Loops type B: for professional shipping. The RLS type B was developed for professional shipping and for high-sided ships that are equipped with a crane or other mechanic hauling device. (operation field for example: ferrys, cargo- and coast motor boats, drilling rigs, custom boats, coast guards and all maritim areas, as well as ports and special vehicles). RLS - Rescue Loops type L: for air rescue. RLS - Rescue Loops type S: for sport boats. Schwindt, Michael; Baumeier, Wolfgang (2010): 'Recovery of persons from the water at sea' In: HANSA International Maritime Journal, V. 8, P. 194. Tsolakis, Konstantin (2010): 'Help for the hypothermic' In: Safety at Sea International, V. 11, P. 11. The development and design of prototypes are mainly financed by the SARRRAH®-Project.